Just because Christmas is over doesn't mean we stop baking cookies. 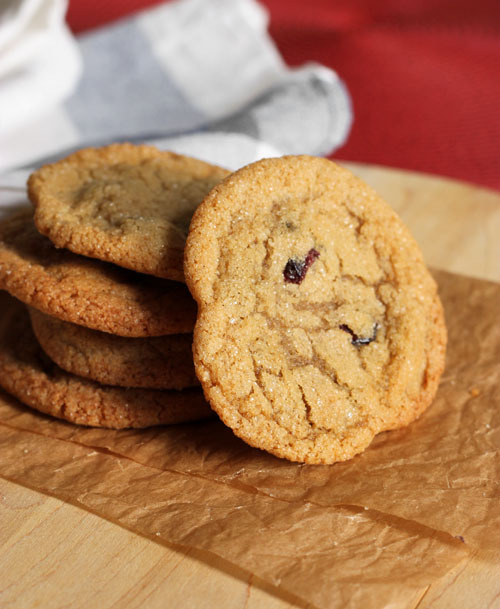 Cookie season is all year long around here (and ramps up in the winter! 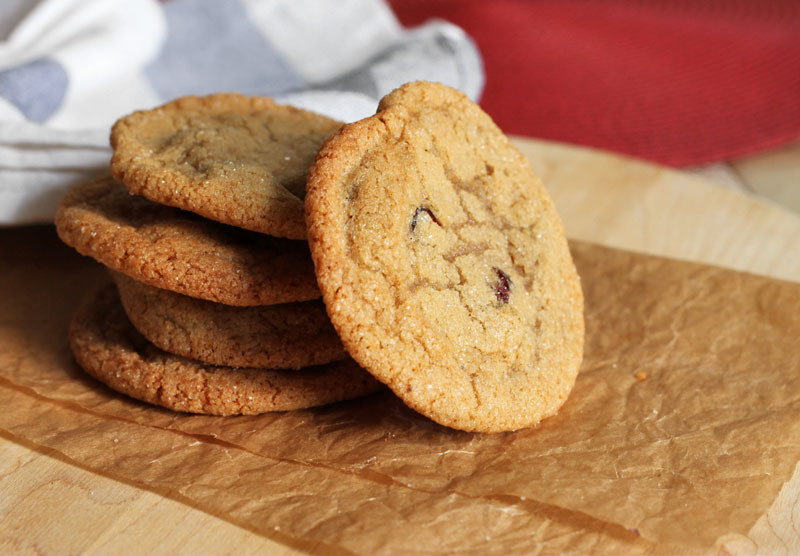 ), so there will be no shortage of cookie recipes gracing this blog. 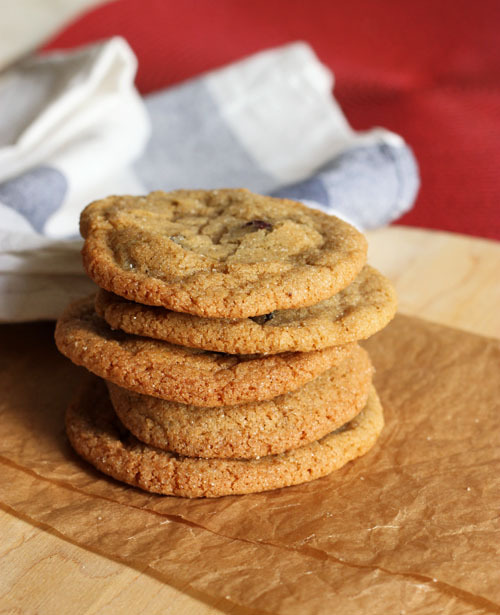 Today's recipe is one of maybe 5 ginger cookie recipes I have here. Why does this one have a place? For three reasons. 2) there's no molasses - it's all about the ginger-vanilla flavour! 3) they have crisp edges and are so undeniably chewy that they're not even soft - just plain CHEWY through and through. And that's awesome. 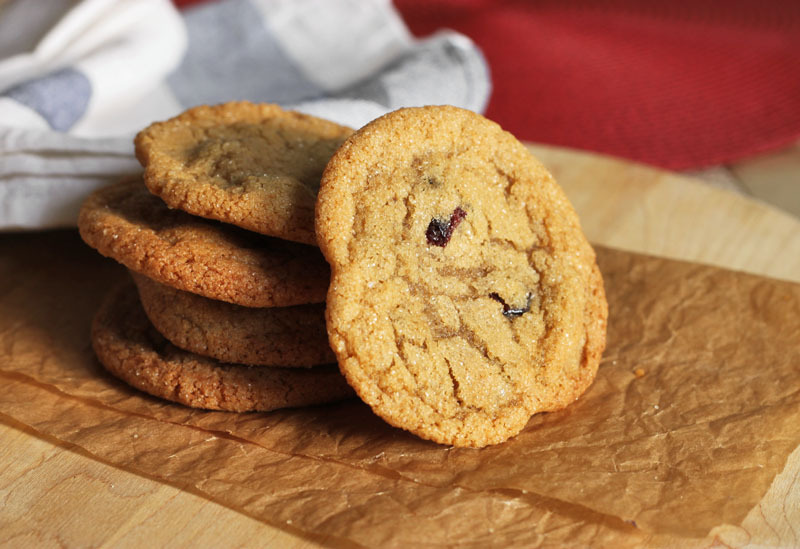 The other lovely thing that sets this recipe apart from the rest of my ginger cookie recipes is the heavy use of vanilla extract. Most ginger cookies rely on the flavour from the spices so they can shine, but the combination of vanilla and ginger is so lovely and incredibly soothing. Add a handful of dried cranberries and this recipe becomes perfectly festive (even though we're not singing carols anymore). Melt butter in the microwave in short bursts until it is mostly melted, then stir to melt the rest. Don’t let it bubble or boil because we want the water in the butter to remain. Pour butter into a mixing bowl and add both sugars. Beat until combined and it looks like sludge. Mix in vanilla and salt. Beat in cold egg until well incorporated, smooth and slight thickened. Sift flour, ginger and baking soda over the mixture and fold it in until mostly blended. Fold through dried cranberries. Cover the bowl with plastic wrap and refrigerate the dough for at least 2 hours. Preheat your oven to 350°F. Line two large baking sheets with parchment paper. Scoop mounds of dough onto prepared baking trays (do not flatten). Space them at least 3 inches apart. Bake for 10-12 minutes until evenly browned. Let cookies cool on the tray for a minute before transferring individually to a wire rack to finish cooling. Hi Brittany! It's about a 1.5-oz scoop, but the cookies spread well so it makes big ones!